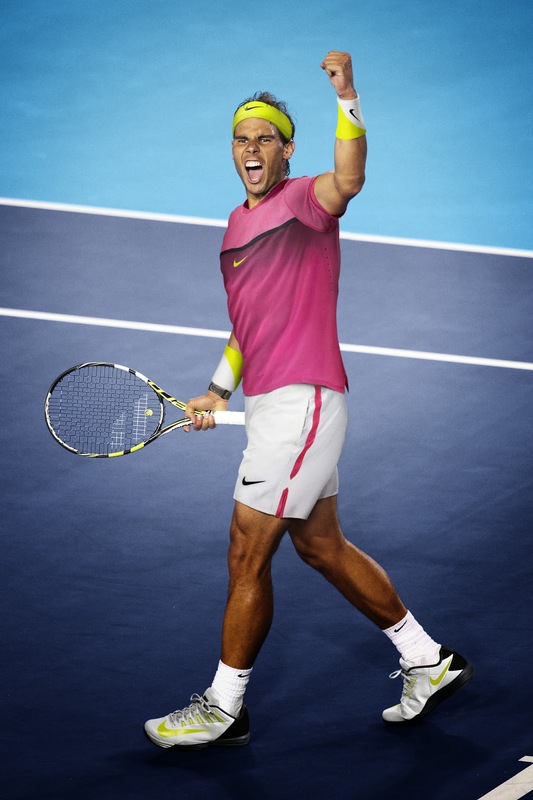 The indefatigable Nadal begins his 2015 major campaign wearing the ultimate in breathable cool. His brightly colored Nike Challenger Premier Rafa Crew is designed for unrestricted motion and to provide the maximum amount of breathability and moisture management. He will complement the top on-court with the Nike Gladiator Premier 7" short in DriFIT fabric. His Nike Premier Rafa Jacket has a paneled hood, thoughtfully placed zip pockets keep small items secure and Nike Tech Fleece fabric innovation provides optimum comfort. Nadal’s footwear is the responsive Nike Lunar Ballistec 1.5 with unprecedented speed and control in one of the lightest and fastest tennis shoes Nike has ever made. Key features include Nike Flywire that is utilized to provide a supportive fit, increased ventilaton and Drag-On outsole technology for durability where you need it most.